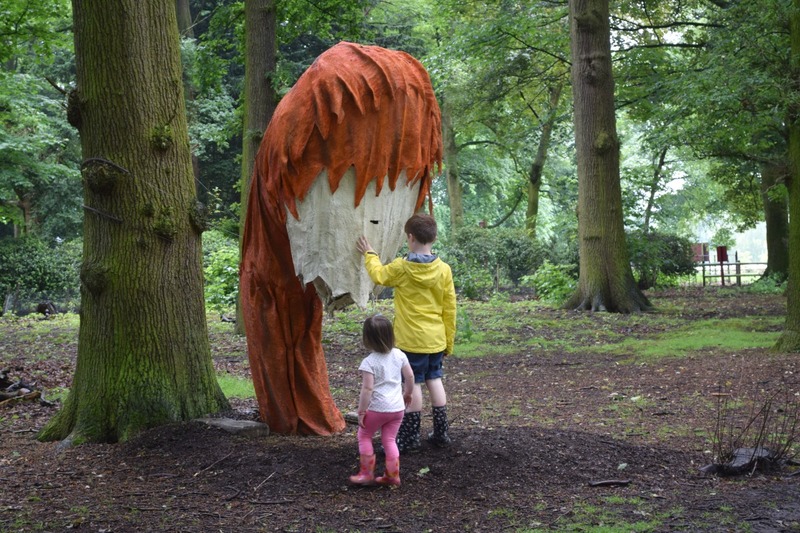 I started writing this before we went away, but you will all know how hectic things are the few days before a family holiday (especially if like me, you moved house a week before and can’t find anything you want to pack!). 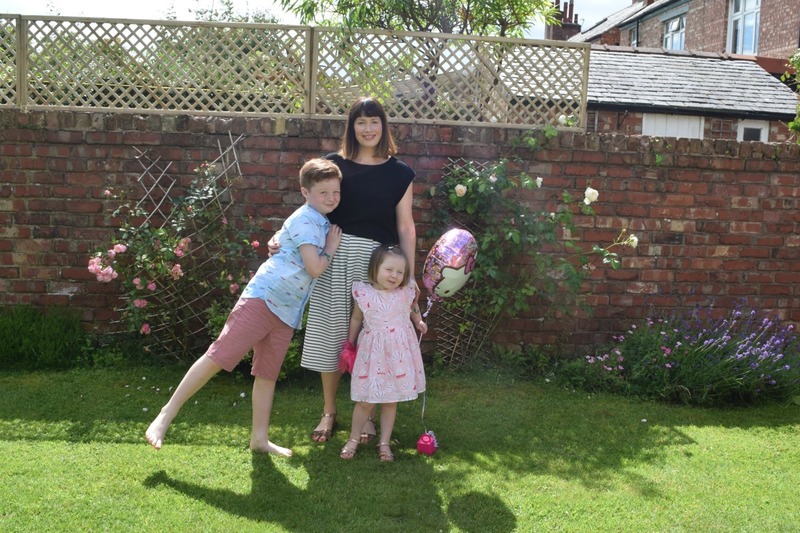 So I’m just finishing it off while I am away in Portugal, I’ve just managed to grab a bit of time to myself as everyone is still asleep – both my kids invaded my bed – so I can also write about what we packed and whether it was the right thing or not. I am not one to travel light, so I’m probably not the right person to be telling you how to pack for a family holiday. I had a night away last week and managed to fill a small cabin-sized suitcase, large handbag and I needed an extra shoulder bag to carry my lunch! Going away for a week with my two children I just wasn’t sure how many cases to pack, how little I could cope with, and whether I could really survive without my laptop, extra few pairs of shoes, at least two outfits per day or all those phone/camera/DS chargers. I haven’t been abroad for more than three years and never with this family dynamic, so I am anything but a pro at what I really need to take. I had worked out though, that to keep the kids happy they all needed to have their own bags with their favourite things accessible and easy for them to carry. Sam has always taken his Trunki wheeled suitcase away with him before, which is fab but this time I tried to pack all our clothes in two larger cases and just take smaller rucksacks for the little ones. As there are three children on this holiday, Sam and Florence and their friend Joe, we were going to use these three backpacks for the hand luggage. 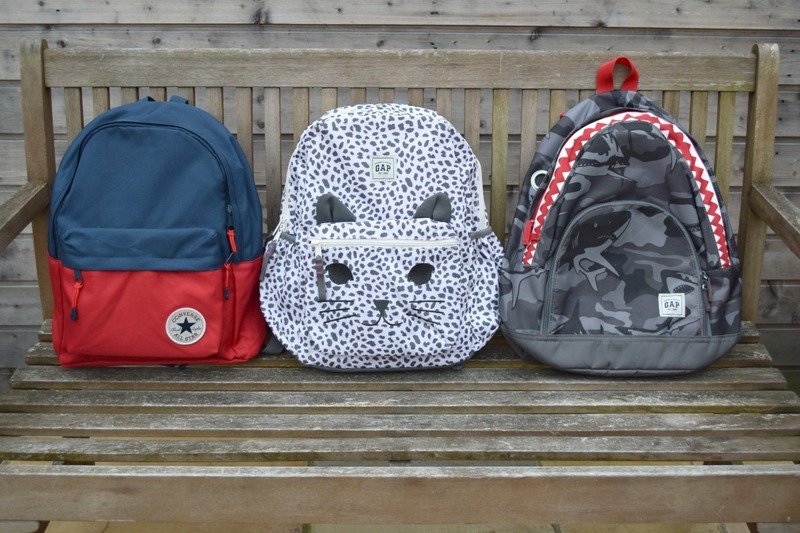 The were (from left to right above) a blue and red one from Converse, which will be available soon from House of Fraser; a pink animal print cat one from Gap, and a shark one, also from Gap. 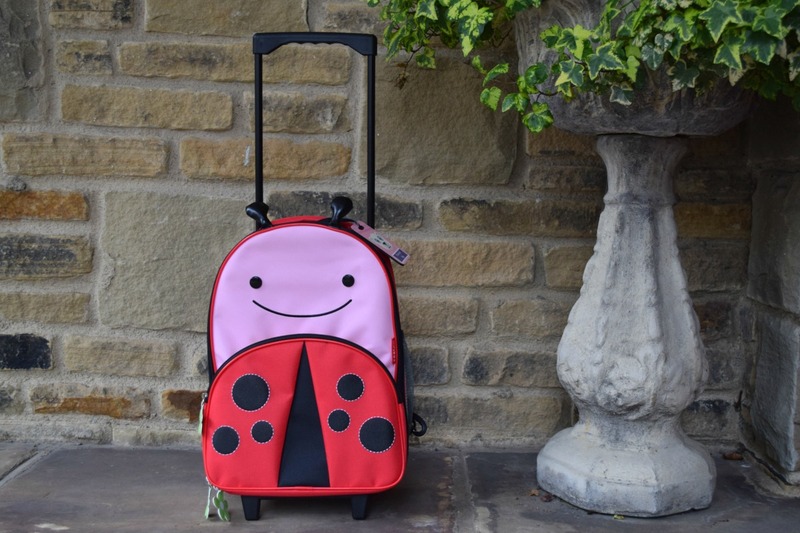 This kind of changed at the last minute when I decided to use this Skip Hop ladybird wheelie case for Florence, who was adamant she would have her own suitcase and it would be pink. It was a good move as it meant she could pack her favourite books and toys without me worrying about how heavy it was for her to carry. The bag has as much room as a very generous rucksack, but opens up all the way round like a suitcase and is light and really easy for her to wheel around by herself. It will be great for weekends away and overnight stays at Granny’s as well as for this holiday. 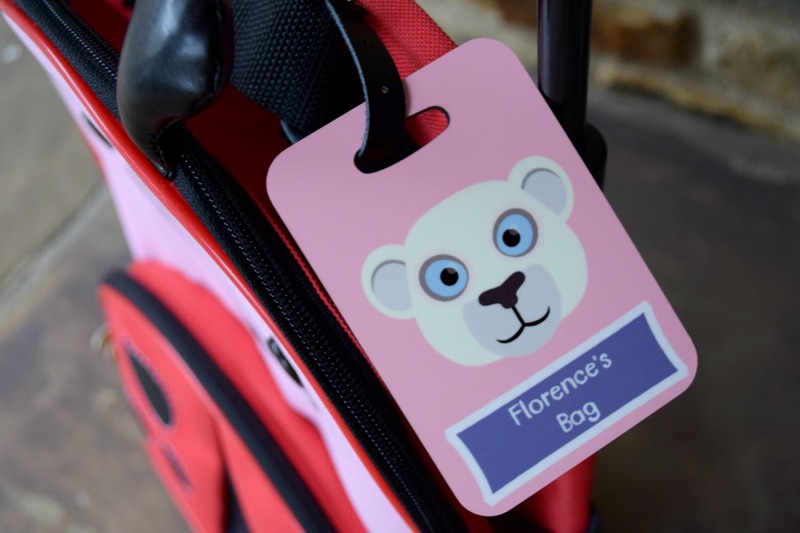 I added one of these personalised luggage tags from Coconutgrass too, seen in the to photo – they are super sturdy and have been on a few trips with us already. They are sold as tags for school bags or luggage and would really be great for both. They are £9 and come in 11 different animal designs. The decision to pack few cases was really because there was to be five of us in the car and it might be a challenge fitting everything in the boot if we had a suitcase each. As it turned out, we hired an estate car and the boot was really generous so that wouldn’t have been too much of a worry, but travelling as light as possible is still always the best option, isn’t it? 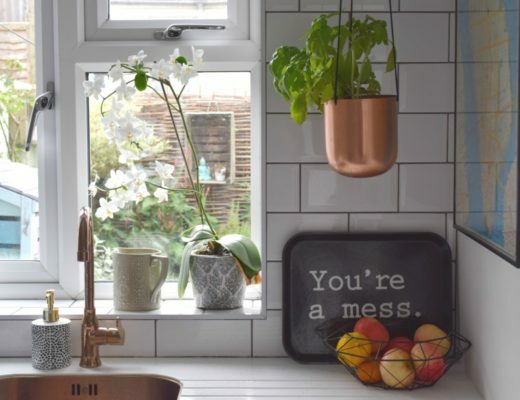 I consulted my good friend and family travel blogger Karen on this, and as she jets off with her husband and three girls fairly regularly she gave me some good tips on the best way to pack. One medium sized suitcase and another wheeled holdall, as holdalls are easier than hard cases to squish into a car boot or footwell when you get to your hire car. 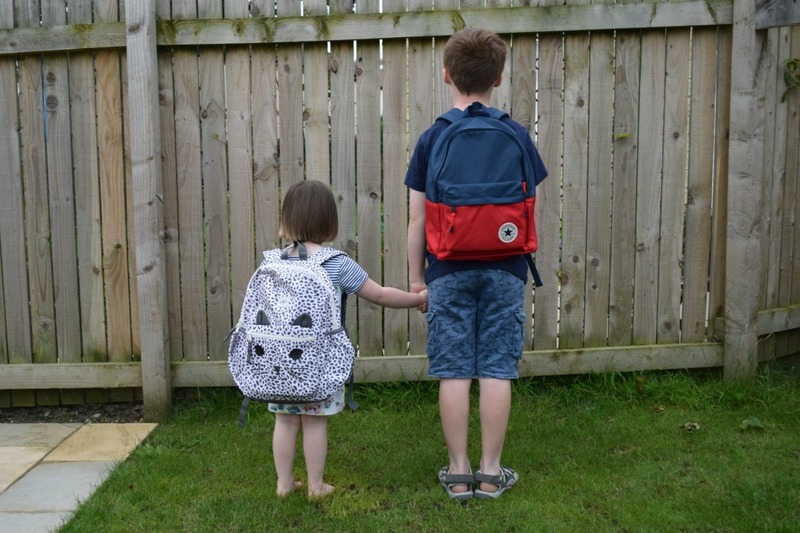 Smallish rucksacks for the kids so they can hold their own things, such as a few toys, some of the mountain of snacks you will no doubt pack, and maybe some colouring things and books. So simply put, that was my aim for this trip away. Flo got so excited at the thought of packing holiday things that she grabbed her bag and quickly filled it with everything she wanted to take. This included of course lots of things I wouldn’t want her to take, like a toy laptop, two pairs of princess shoes and six hardback books! 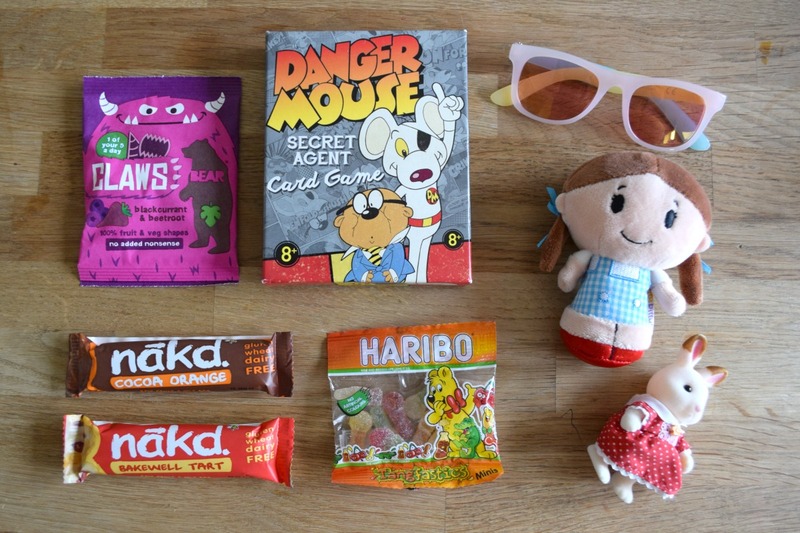 I photographed a few of the things we packed, like a mixture of healthy and not-so-healthy snacks, some of our favourite books, toys and of course sunglasses. 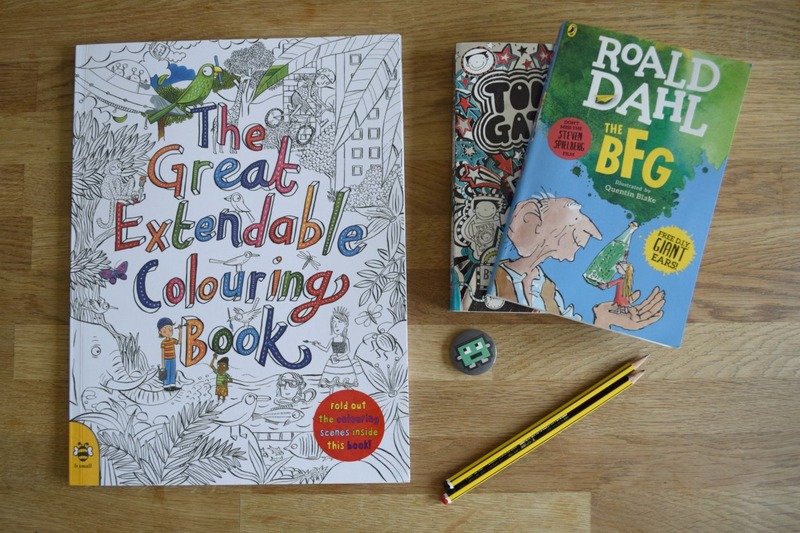 You might have spotted The Great Extendable Colouring Book in there too, which I recently reviewed. There is also this excellent Danger Mouse game which I bought from a local bookshop, which Sam and I have played most nights since we bought it three weeks ago. Having a look around for kids’ travel inspiration I found these cool things too. Top row, l-r: Animal Camouflage Book, B Small; Trunki Tony the Taxi case; Luggage tag from Coconutgrass. Middle row: Colouring pencils, Not On The High Street; JVC Tinyphones kids headphones; Leopard print sunglasses, Little Fierce Kids. 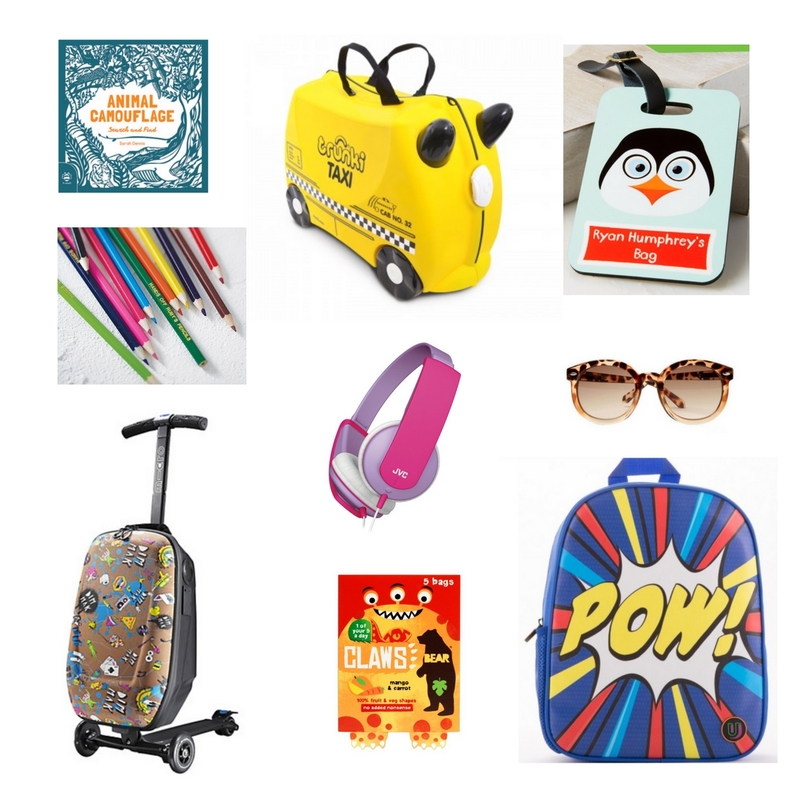 Bottom row: Micro 3-in-1 Luggage Scooter, Steve Aoki Limited Edition; Bear Claws snacks; Mini Pow Backpack, Little Fierce Kids. As for actual luggage, well as I like to pack a LOT of stuff, I just enjoyed reading this amazing article about How to Never Overpack Again. It even includes a mathematical equation to work out how many dresses, tops and bottoms you should pack. Genius! I was sent the Skip Hop case to review. We absolutely love the Trunki and its exclusively used for all the nappies and wipes and kids clothes. So handy …until z gets bored of it and I have to carry it. it looks like you had a really amazing time!